My e-mail message via her website one time would be more likely. Just mentioning the lyrics in a thread in the Other music thread isn't quite as likely. I even have my doubts that Hayley saw what I wrote to her back then.. I can't remember exactly when it was, but it might have been 2008 or so. Of course, it's fun to think that she might have heeded our suggestions, but I think it's most likely coincidence, even in my case. I have now uploaded to the HWI website the video sent by Maya which includes all of Hayley's involvement - BOTW is the background music (with some voice-over on top) in two places, including the end of the programme and end credits. It is just the sound recording of BOTW. Sadako Ogata has been an important humanitarian senior official at the U.N. - as Maya said, she was for ten years the head of UNHCR and previously a top UNICEF official. So the programme is a tribute documentary to her important work. Frank Lin has noticed a surge in views of BOTW. He has posted this on Facebook. 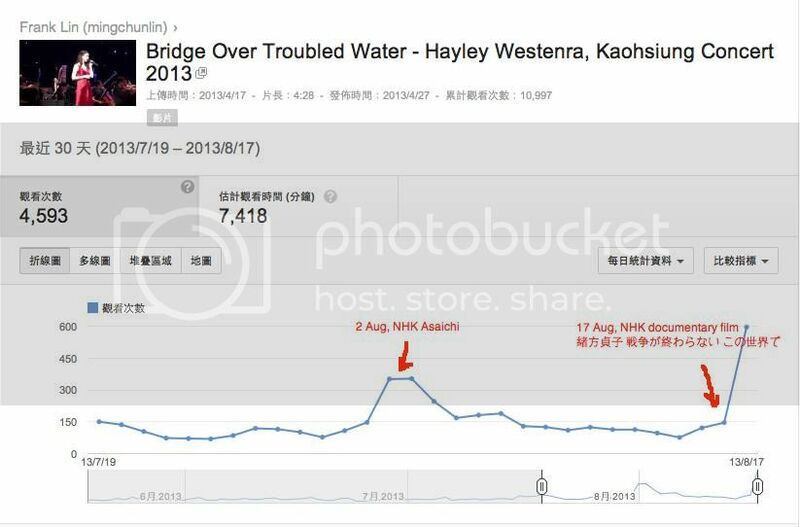 My Hayley's live BOTW video on youtube, 2 peak views have happened: one was after she performed BOTW in NHK Asaichi on 2 Aug, the other was just after that documentary film formally screened at NHK TV channel on 17 Aug.
Wow! 600 views per day, and most viewers were from Japan. Just checked the stats for my YT channel for hits from Japan. I too have peaks on 1st and 17th August, and I don't even have a video of BOTW on there. It shows a general upsurge in interest in Hayley on those dates when she had TV exposure. Nice to see. Thanks to the D&M engineering team for the latest addition. Hayley's BOTW playing in the background makes for pleasant listening. That Ms Ogata has certainly had a remarkable career. I noticed Kofi Annan standing on stage with her after she gave her little speech in English. With her, once chairing the UNICEF Executive Board, and Annan as Secretary General of the UN for ten years (from Ghana, no less), Hayley is actually a quite fitting choice for the program.